Well last night was the Preview Night of San Diego Comic Con 2017. The Preview night is basically a short evening previewing some products and event. 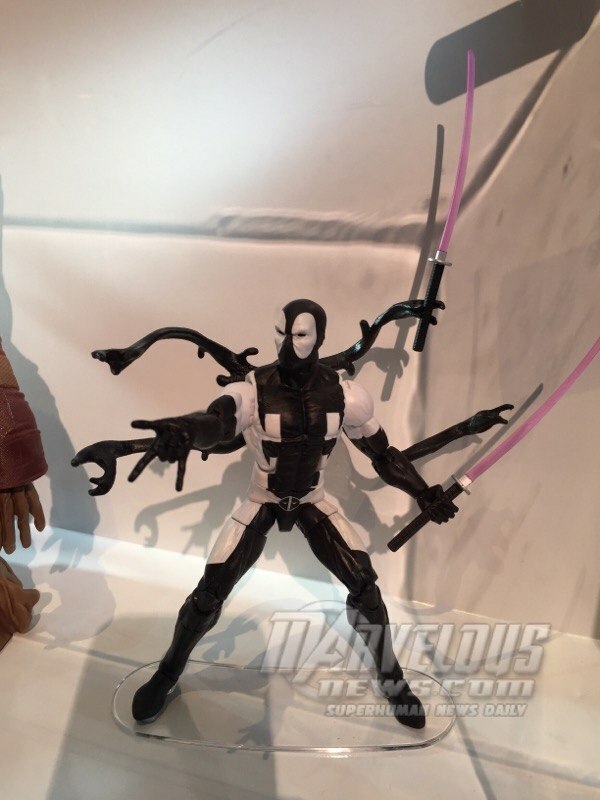 As such most companies don’t shown much in new products so there wasn’t much in new reveals for Marvel Legends. What was seen was basically most of the stuff we have seen already. That being the Man-Thing wave, The A-force box set, The SDCC Exclusive, The Invisible Woman and Human Torch exclusives as well as all the Thor stuff. There was one new reveal and that was the Gamestop Exclusive Marvel Legends Venom-Pool. This comes from Deadpool storyline where he get to wear the Venom Symbiote in Back To Black. Not shown here but the figure will come with multiple hand and a repaint Superior Venom alternate head so that you can also recreate the version seen in the Venom-Verse Story line. Since I just set up a Symbiote/Venom-Verse Shelf I will be getting this but I know many people will skip it just to being an obscure version of DP. Nice figure though.